For years, the massive annual meeting of the American Educational Research Association has been a hotbed of the latest research and new ideas about teaching-and-learning practices and policies. This year, some 65 UF College of Education faculty and students participated in the 2013 meeting April 27-May 1 in San Francisco, joining 14,000 other education scholars from 75 nations. This year’s meeting theme focused on the relationships of education and poverty—how education theory, research, policy and praxis contribute to alleviating economic, intellectual and moral poverty. More UF education scholars, from multiple disciplines, attend AERA’s annual meeting than any other professional gathering. The EduGator contingent in San Francisco included 34 college faculty and 31 graduate students participating in presentations, panel discussions and association-related business meetings. Does teacher preparation for English Language Learners matter? Leadership standards and accountability in Florida: Do they address poverty and social justice issues? 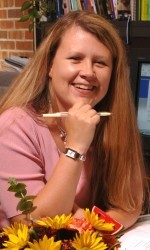 Writing instruction: What do preservice teachers know? The busiest COE faculty attendees were Walter Leite and Mirka Koro-Ljungberg (both from research and evaluation methods), with four presentations each. Mary Brownell (special education), Ester de Jong (ESOL/bilingual education), Bernie Oliver (education leadership) and Albert Ritzhaupt (education technology) each made three presentations. 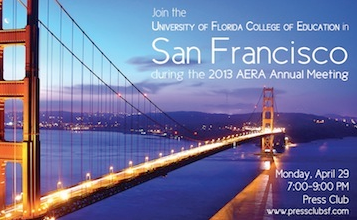 The complete AERA annual meeting program is available online at www.aera.net.